Posted October 7, 2014, in Student Alumni. 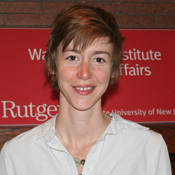 Abigail Todhunter-Reid was a PhD student in the Department of Childhood Studies. Her research interests include exploring the differential predictive validity of IQ and emotional competencies, particularly in the context of high-stakes testing. Abigail worked with the South Jersey Strengthening Families Initiative team and loved every minute! This page was printed from http://rand.camden.rutgers.edu/2014/10/07/abigail-todhunter-reid/ at 8:21 PM Saturday, April 20, 2019.